Just another couple of days in the office! You may have noticed that I didn’t get around to writing a blog last week. No real excuses I’m afraid, just lots of work….. Including two days in the Luss Hills office! A week ago, Nita and I were sat on the side of Beinn Dubh eating our lunch and peering through very dense haze out over Glen Douglas towards Loch Lomond and Ben Lomond. It was a very strange kind of light that day, with heavy brooding cloud cover that gave way every now and again to patches of brightness and weak sun. The hazy conditions though meant that the views were limited somewhat although very atmospheric. That day was our first proper hill walk since way back in September and the steep slopes of these relatively small Luss Hills gave our legs a good test! I have to admit to feeling a little shattered as I made my way up the final steep section towards the summit of Beinn Dubh. It was though, so good to be back! 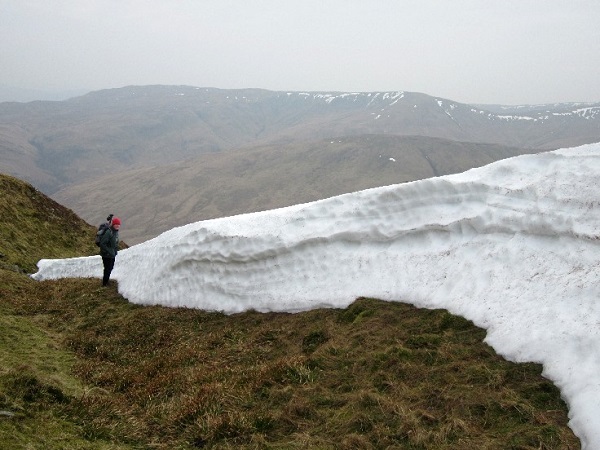 We wandered along the broad ridge towards Mid Hill and finally found the perfect lunch spot that also gave quite dramatic views of the steep north facing slopes of Mid Hill, still holding large deep patches of snow. We weren’t alone for our lunch though as soon after parking ourselves down, we were joined by a very fine looking Raven. He or she wandered around about five metres from us and although we told it that it didn’t eat Primula Cheese filled bread rolls ….it wasn’t convinced. Indeed, after a short while we were persuaded to offer a beak-full to this magnificent looking bird and after a few tentative forays, it came close enough to get the food. And it seemed to like it too! It stayed with us, waiting for further offerings. These wonderful birds are great to watch when they are in the air as they tumble about doing crazy acrobatics, but I don’t think I’ve ever seen one up so close on the ground. Yesterday, after a very late start, (we didn’t start walking until 11.20 am) Nita and I were back to the Luss Hills again. This time though, visiting some tops that we’d never been to before. 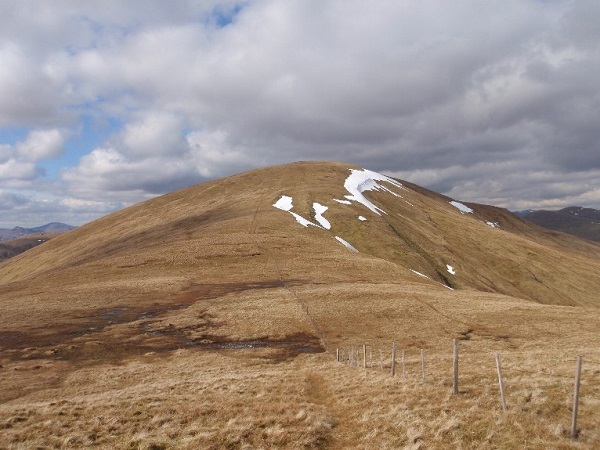 Beinn Chaorach at 713 m is the second highest point in the Luss Hills and sits to the south of Glen Luss, right on the edge of the divide between the Highlands and the Central Belt of Scotland. We’d often thought about visiting these tops but for some reason, had never before got around to it. 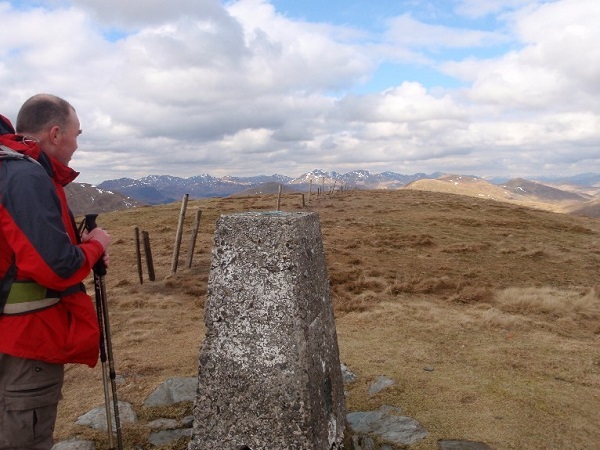 Like all of the Luss Hills, it was a very steep haul up to reach the broad connecting ridge that led over a couple of smaller tops to the rounded bulk of Beinn Chaorach. Yesterday, unlike last Thursday, the air was incredibly clear and the views from this quite lofty little top were very big indeed. Nita said that she could clearly see Ailsa Craig way down in the Firth of Clyde and even I could see the rugged tops of the Arran Mountains with my monocular. We had a day of bright sun and dark clouds and it made for some beautiful scenes. Patches of bright colours and deep shade moved across the landscape, and if it hadn’t been for the very cold wind, it would have been the perfect day for a lengthy stop. March being March however and despite it being officially spring and all that….. winter was still very much around. Yesterday’s lunch break was therefore a far shorter affair than last weeks. 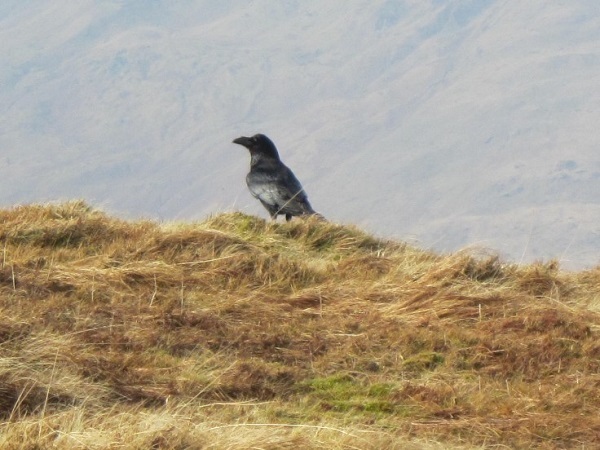 The Beinn Dubh Raven didn’t spot us from the other side of the glen and so we didn’t have to share our sandwiches this time! Heading for Beinn Chaorach, a steep climb ahead! One of my pet hates I have to admit is being on a hill and hearing another walker talking into their mobile phone. I guess I must be turning into one of those grumpy old men ….although Nita will tell you that I got there years ago. Anyway, in the past, although I always took my phone with me on walks (in case of emergencies) I always kept it turned off. Yesterday however, I managed to leave it turned on and half way back along the ridge, the phone starts ringing loudly. Thankfully there were no other walkers around and so, there I stood, with half of southern Scotland stretched out before me, carrying on a conversation with a bloke working at Heathrow Airport! 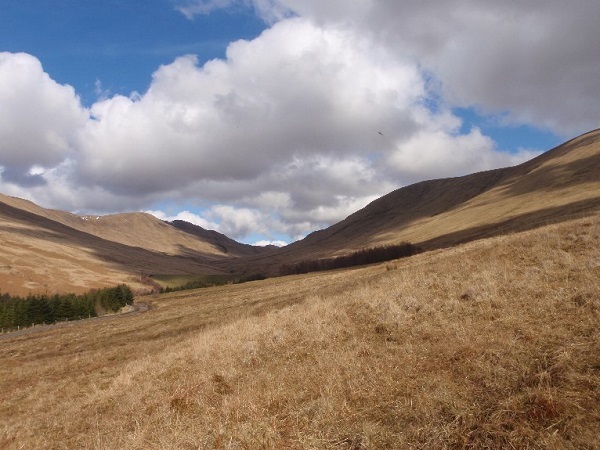 It felt quite bizarre….I was in my Luss Hills office!